Mark Masterson, executive director of the Northside Community Development Fund, walks around a North Side home on Bonvue Street that was abandonded several years ago and is pegged for redevelopment. The Northside Leadership Conference, the parent organization of Masterson's group, built two houses on vacant lots on Woodland Avenue in the Marshall-Shadeland neighborhood. Masterson says this vacant lot on Bonvue Street in Observatory Hill may be transformed into a hops garden for a local brewery. The Northside Leadership Conference is working with community groups to make it happen. A blighted house on Woodland Avenue in the Marshall-Shadeland neighborhood of the North Side. The house will be redeveloped soon with help from the Northside Leadership Conference. The windows were busted on an abandoned house in Marshall-Shadeland. Instead of bulldozing houses and rebuilding, Masterson said his organization has a long history of rescuing buildings. Masterson says this Cowley Street house in Troy Hill was built on vacant land by Troy Hill Citizens, Inc., with project management provided by the Northside Leadership Conference. *Part two in a three-part series. Through the dated kitchen and a hallway with a gaping hole, past the stacks of dusty Bibles and art history books, a grand staircase snakes through the old mansion. Cracked vases are strewn at the foot of the landing — at one time, the homeowner was a collector. Now, this home on Millionaire’s Row in McKeesport smells of mildew and you can’t stay inside for too long without getting lightheaded. But the crown molding still wraps the perimeter of each bedroom. You can imagine its Victorian glory through the rubble. “Every house has a story,” says Maryann Huk, director of the McKeesport Preservation Society [MPS]. And every house has its own remnants of life. Sometimes dishes are left on the table. Food in the refrigerator. And the owners long gone. It’s like an image taken straight from the aftermath of the Great Depression, Huk says. In Allegheny County, there’s roughly a dozen preservation groups, and most are nonprofits, according to Preservation Pittsburgh. 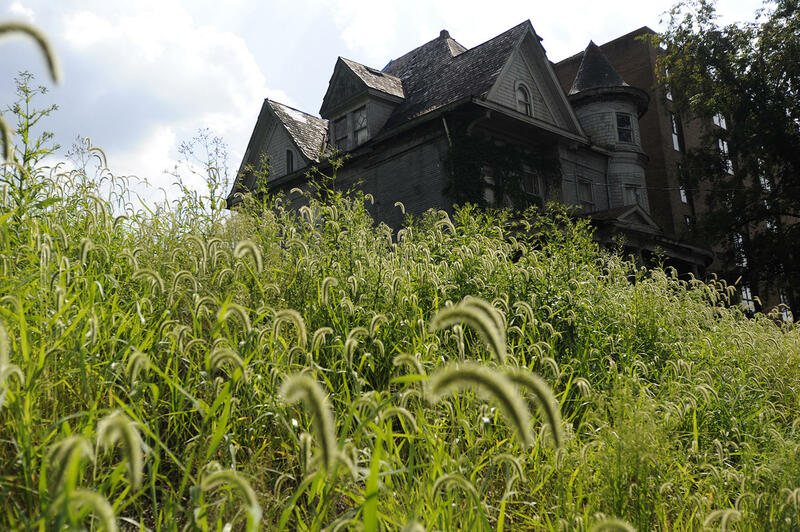 It'd likely be cheaper to demolish this Victorian mansion than to complete a historical preservation, but then it'd be adding to more than 2,500 vacant lots already in McKeesport. MPS, one of those nonprofits, plays a vital role in McKeesport where more than a quarter of homes in its school district are tax delinquent. Some buildings are on the brink of collapse, and the city is threatening demolition. The McKeesport Housing Authority is currently planning to demolish the former First Baptist Church at 409 Olive St. As the last brownstone structure in the area, it has enough historical significance for MPS to speak out against the housing authority’s move. In a recent Facebook post, the preservation society said the housing authority's quest to demolish the church for a greenspace project is ironic for a town with more than 2,500 vacant lots. The office of McKeesport Mayor Michael Cherepko did not comment for this story. After three phone calls and an email, his office did not provide a representative to discuss demolition projects. “We’re just trying to ensure that properties that don’t need to come down, don’t come down,” Huk said. Otherwise, that’s money poorly spent. Huk’s goal is to get as many houses as possible back on the tax roll, and with their character still intact. Generally, most demolitions cost between $5,000 and $10,000, according to Mark Masterson, executive director of the Northside Community Development Fund. Historical preservations in McKeesport run between $15,000 and $25,000 on average, said Mike Pachulski, another preservation expert in McKeesport. Huk's latest renovation project, a Victorian home built in 1900, has been a target for demolition because it has been vandalized. She wishes the city would reconsider demolishing abandoned homes when residents agree to take them on as fixer-upper projects. That way, homes like her 1900 Victorian may be rented or sold, rather than lost. “We’re building huggers,” she said. Pachulski said he thinks most vacant houses can be rehabbed. “If the foundation is intact, and there isn’t severe structural damage, it’s just a matter of how much time and money someone is willing to spend fixing it,” he said. "Every house has a story." If her 1900 Victorian can be sold, Huk hopes to include an agreement in the deed to keep the home’s identity. When a home is not eligible for the National Register of Historic Places, an easement or covenant can be written into the deed of the house to ensure that certain aspects of the home cannot be removed and certain additions may not be made. That way, the new owner knows the house is supposed to be preserved, not torn down or even reconfigured. “This is one way we can make sure the homes we work on don’t become empty lots,” Huk said. In Pittsburgh, the Northside Community Development Fund is doing similar work on a much larger scale. Rather than tear down homes that have been slated as blighted, vacant or tax-delinquent, the group tries to find uses that take advantage of what’s already standing. At one point, Masterson, the fund’s executive director, said its parent organization — the Northside Leadership Conference [NSLC] — could have been considered the biggest developer of single-family housing in the city. The organization’s job is to find funding for community groups to develop homes and commercial properties in neighborhoods where blight is hurting the real estate market. The group finds funding and loans it out to community groups who wish to develop homes and commercial properties in North Side neighborhoods. Loans from the Urban Redevelopment Authority and local banks, as well as grants and deferred mortgages, provide funds for this development. Masterson said the North Side has experienced a long history of neglect by the city. This led individual neighborhood groups to take on real estate development. The challenge, though, is that properties are worth little to start and the costs are high. According to Masterson, total development costs for most projects average $215,000 per unit, with an average construction cost of about $135,000. "It was the first time the community flexed their muscle to say, 'We don't want this crap.'" But people have a tremendous pride in place. Masterson has been witnessing it since he first became a community organizer in the 1980s. Back then, a local doctor named Dr. GeorgeMagovern wanted to try his hand at development. He bought a vacant Giant Eagle supermarket near the NorthsideChronicle’s offices with an intention of building a Burger King, Masterson said. More than 300 community members came together to block Magovern’s plans. They wanted to prevent him from tearing down homes on several central streets for his project. “It was the first time the community flexed their muscle to say, ‘We don’t want this crap,’” Masterson said. In the early 2000s, Masterson’s group funded a project on the same site. The block of homes on the corner of Middle and Tripoli streets now stand in proud North Side fashion, complete with red brick and bright green and gold doors. In Allegheny West, the organization redeveloped a series of 4,000-square-foot homes. They didn't have enough money to renovate both the inside and outside of the homes, so the group focused on fixing roofs, windows and porches. The group sold the homes for between $40,000 and $50,000, giving homeowners an incentive to buy them and finish rehabbing the inside. Private developers’s default is often to demolish and rebuild. In the North Side, Masterson and his organization have a long history of rescuing buildings that could be targets. Find this report and others on the site of our partner, PublicSource. What does Pittsburgh have in common with Copenhagen, Hong Kong and Melbourne? Each was selected as one of top 11 cities in the world “to live, work and play in” by Metropolis magazine for a particular livability feature: from walkability — Copenhagen, to culture — Hong Kong, to smart infrastructure — Melbourne. The magazine, which deals with architecture and design, cited Toronto, Tokyo and Helsinki as the three most livable cities in the world overall. But Pittsburgh was honored for its advanced historic preservation. City Council on Wednesday gave preliminary approval to a proposal to nominate the Lawrenceville neighborhood for the National Register of Historic Places. Councilwoman Deborah Gross said a national register status is different than historic designation through the city’s Historic Review Commission, because the former doesn’t restrict how property owners can maintain, update or renovate buildings within the district. Preservation Pittsburgh is asking City Council to designate three natural springs as historic landmarks. Members are advocating for Howe Springs in Shadyside, Snyder (Catahecassa) Spring in Schenley Park and the Spring in Spring Hill (Voegtly Spring). Huffington Post recently named Pittsburgh one of the top ten cities that techies should move to. Last year, Zagat named Pittsburgh its top food city. And Vogue just ran an article about the Ace Hotel in East Liberty.